As I write about the benefits of functional programming in this chapter, I need to separate my answers into two parts. First, there are the benefits of functional programming in general. Second, there are more specific benefits that come from using functional programming in Scala. I’ll look at both of these in these chapter. I’ll discuss these benefits in this chapter, and then offer further proof of them as you go through this book. In the rest of this chapter I’ll explore each of these benefits. The book, Real World Haskell, states, “Purity makes the job of understanding code easier.” I’ve found this to be true for a variety of reasons. First, pure functions are easier to reason about because you know that they can’t do certain things, such as talk to the outside world, have hidden inputs, or modify hidden state. Because of this, you’re guaranteed that their function signatures tell you (a) exactly what’s going into each function, and (b) coming out of each function. I spend less time “reading” them. I can keep fewer details in my brain for every function that I read. Because I can read pure functions faster and use less brain memory per function, I can keep more overall logic in my brain at one time. Although he’s writing about Lisp, the same logic applies to writing pure functions. Another way that pure functions make code easier to reason about won’t be apparent when you’re first getting started. It turns out that what really happens in FP applications is that (a) you write as much of the code as you can in a functional style, and then (b) you have other functions that reach out and interact with files, databases, web services, UIs, and so on — everything in the outside world. 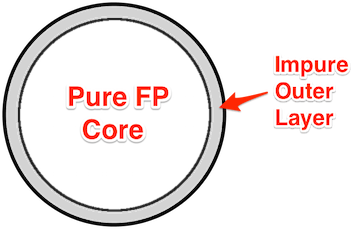 The concept is that you have a “Pure Function” core, surrounded by impure functions that interact with the outside world, as shown in Figure [fig:benefitsPureFpCoreV2]. Given this design, a great thing about Haskell in particular is that it provides a clean separation between pure and impure functions — so clean that you can tell by looking at a function’s signature whether it is pure or impure. I discuss this more in the coming lessons, but for now, just know that developers have built libraries to bring this same benefit to Scala/FP applications. You can’t tell much about what that method does by looking at its signature, but — because it returns nothing (Unit) — presumably it (a) modifies those variables, (b) changes some hidden state, or (c) interacts with the outside world. Beyond making unit testing easier, because functional code is like algebra it also makes it easier to use a form of testing known as property-based testing. I write much more about this in the lesson on using ScalaCheck, but the main point is that because the outputs of your functions depend only on their inputs, you can define “properties” of your functions, and then ScalaCheck “attacks” your functions with a large range of inputs. Because pure functions depend only on their input parameters to produce their output, debugging applications written with pure functions is easier. Of course it’s possible to still make a mistake when you write a pure function, but once you have a stack trace or debug output, all you have to do is follow the values to see what went wrong. Because the functions are pure, you don’t have to worry about what’s going on in the rest of the application, you just have to know the inputs that were given to the pure function that failed. ScalaCheck is a property-based testing framework for Scala that was inspired by Haskell’s QuickCheck. People that are smarter than I am can make the mathematical argument that complete FP applications are more bulletproof than other applications. Because there are fewer “moving parts” — mutatable variables and hidden state — in FP applications, mathematically speaking, the overall application is less complex. This is true for simple applications, and the gap gets larger in parallel and concurrent programming (as you’ll see in a later section in this chapter). How much time is left in the quarter? What distance is needed to make a first down? In short, although a football game is pretty simple compared to a business application, it still has a lot of “state” that you have to maintain. And when you’re mutating that global state from several different places, well, it turns out that sometimes the computer gets an extra play, sometimes time doesn’t run off the clock, etc. Skipping all of my imperative state-related bugs … once I learned how to handle state in FP applications, I gave up trying to fix those bugs, and I’m now rewriting the core of the application in an FP style. As you’ll see in this book, the solution to this problem is to pass the state around as a value, such as a case class or Map. In this case I might call it GameState, and it would have fields like quarter, timeRemaining, down, etc. As an analogy, one time I had a house built, and I remember that the builder was very careful about the 2x4’s that were used to build the framework of the house. He’d line them up and then say, “You do not want that 2x4 in your house,” and he would be pick up a bent or cracked 2x4 and throw it off to the side. In the same way that he was trying to build the framework of the house with wood that was clearly the best, we use pure functions to build the best possible core of our applications. Yes, I know that programmers don’t like it when I compare building a house to writing an application. But some analogies do fit. In the same way that pure functions are easier to reason about, overall FP applications are also easier to reason about. For example, I find that my FP code is more concise than my imperative and OOP code, and it’s also still very readable. In fact, I think it’s more readable than my older code. If you want to see what I mean by FP languages being “low ceremony,” here’s a good example of OCaml, and this page shows examples of Haskell’s syntax. In my experience, when I write Scala/FP code that I’m comfortable with today, I have always been able to read it at a later time. And as I mentioned when writing about the benefits of pure functions, “concise and readable” means that I can keep more code in my head at one time. I emphasize that Scala/FP code is concise and readable because sometimes “more concise” code can be a problem. I remember that a friend who didn’t like Perl once described Perl code as, “Write once, read forever.” Because the syntax could get so complex, he couldn’t modify his own code a few weeks after writing it because he couldn’t remember how each little syntactical nuance worked. I have the same problem writing complex regular expressions. If I don’t document them when I create them, I can never tell how they work when I look at them later. When learning FP, another big “lightbulb going on over my head” moment came when I saw that my function signatures were suddenly much more meaningful than my imperative and OOP method signatures. The correct answer is, “Who knows?” Because it takes no input parameters and returns nothing, there’s no way to guess from the signature what this method does. In contrast, because pure functions depend only on their input parameters to produce their output, their function signatures are extremely meaningful — a contract, even. While writing parallel and concurrent applications is considered a “killer app” that helped spur renewed interest in FP, I have written my parallel/concurrent apps (like Sarah) primarily using Akka Actors and Scala Futures, so I can only speak about them: they’re awesome tools. I wrote about them in the Scala Cookbook and on my website (alvinalexander.com), so please search those resources for “actors” and “futures” to find examples. The author goes on to add the information shown in Figure [fig:benefitsFpConcurrencyStory]. 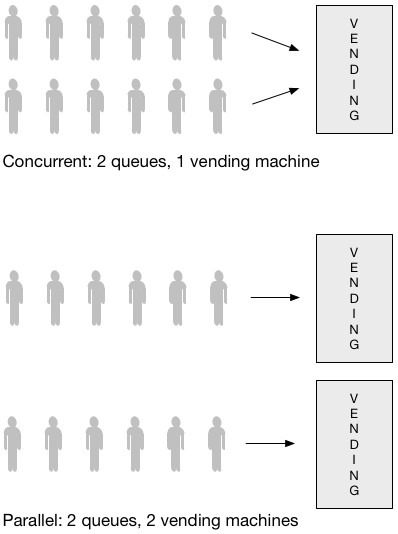 The Clojure.org website adds the statements in Figure [fig:concurrencyBenniesClojure] about how Clojure and FP help with concurrency. Conversely, a nondeterministic algorithm is like asking a user to ask the person next to them what their favorite color is: you’re never guaranteed to get the same answer. If you’re trying to do something like sort a list of numbers, you really want a deterministic solution. Yossi Kreinin created the original version of the image shown in Figure [fig:diffsConcurrentParallel] to help explain the differences between the meanings of “concurrent” and “parallel”. I tend to use the two terms interchangeably, but I will be more precise with my language in the “Concurrency” lesson in this book. I’ve already written a little about higher-order functions (HOFs), and I write more about them later in this book, so I won’t belabor this point: the fact that Scala (a) lets you treat functions as values, (b) lets you pass functions around to other functions, and (c) lets you write concise anonymous functions, are all features that make Scala a better functional programming language than another language (such as Java) that does not have these features. In my opinion, the Scala method syntax is about as simple as you can make method signatures, especially signatures that support generic types. This simplicity usually makes method signatures easy to read. def foo(s: String): Int = ??? These days I prefer to use explicit return types on my methods, such as the Int in this example. I think that being explicit makes them easier to read later, when I’m in maintenance mode. And in an example like this, I don’t know how to make that method signature more clear. def foo(s: String) = ??? def foo[A, B](a: A): B = ??? It’s hard to make it much easier than that. def foo(a: A): B = ??? def getOrElse[B >: A](default: => B): B = ??? Given what generic types represent, I think that’s pretty clear. When I first came to Scala from Java, the Scala collections API was a real surprise. But, once I had that “Aha!” moment and realized how they work, I saw what a great benefit they are. Having all of those standard functional methods eliminates almost every need for custom for loops. The important benefit of this is that these standard methods make my code more consistent and concise. These days I write almost 100% fewer custom for loops, and that’s good for me — and anyone who has to read my code. Because the Scala compiler generates Java bytecode that runs on the JVM, and because Scala supports both FP and OOP models, you can still use all of those thousands of Java/JVM libraries that have been created in the last twenty years in your Scala/FP applications. Even if those libraries aren’t “Pure FP,” at least you can still use them without having to “reinvent the wheel” and write a new library from scratch. These libraries and tools are a great strength of the JVM. If you ask experienced FP developers why they are using Scala rather than Haskell or another FP language, “libraries, tools, and JVM” is the usual answer. 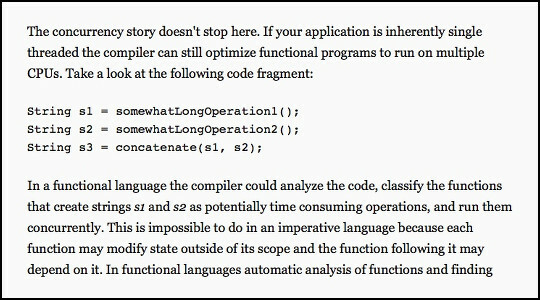 In the 2016 version of Programming in Scala, Martin Odersky’s biography states, “He works on programming languages and systems, more specifically on the topic of how to combine object-oriented and functional programming.” Clearly FP is important to him (as is finding the best ways to merge FP and OOP concepts). In this chapter I tried to share an honest assessment of the benefits of functional programming. In the next chapter I’ll try to provide an honest assessment of the potential drawbacks and disadvantages of functional programming. You can also search my alvinalexander.com website for examples of Akka and Scala Futures.